After over a year of shopping, I finally bought a splitboard. I got a Viole Mountain Gun off of Craigslist. Before I took it backcountry, I decided to try it out at the resort first so that I could work out the kinks in a controlled environment. To cap off the ski season, I offered to buy a lift ticket for anyone in my family who wanted to go up with me. I thought I would get one or two takers, but it turns out that seven people signed up! Becka, Dustin, Larry, Lexi, Kirstie, Matt, and Dalton all went with me to Powderhorn on March 21, 2009. Larry rented a suite at the base of the lift and the entire family showed up for a great weekend. My splitboard is stiffer and longer than my old snowboard. It took some getting used to but I like it. It rides fine on the hard pack and slush... now I just need to get it into the backcountry powder. I need to adjust the back foot pin so that it is easy to put on and off. I also haven't tried out the skins yet. Every native Coloradoan should at least ski Vail and Aspen, right? 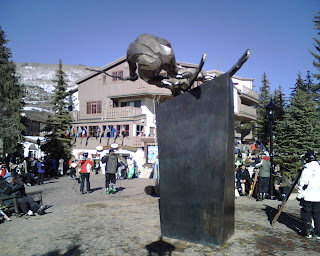 With this in mind, I was excited to ski the famous back bowls of Vail, so I headed straight there from the Rivah and Northwoods lifts. I got a nice todo list of the best runs: Genghis Kahn, Champagne Glade, Little Ollie, etc. 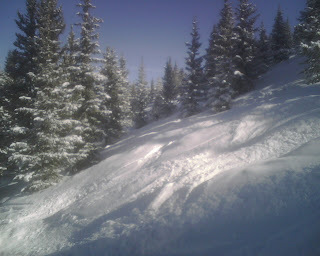 My first run was the Head Wall in the Sun Up Bowl and my first taste of powder over ice. It looked good on the way up, but it was hard to edge on the steeps. I endoed on the first run of the day. I then took the Jade Glade to tick off the first todo. It was more fun than the Head Wall and would be a blast if there was deep powder. From there I headed to the Blue Sky Basin to stay ahead of the crowds. I headed down the Champagne Glade for an awesome run through the trees. It was powder with no ice and very few people. I just had to do it again even though there was much area to explore (photos 2). Little Ollie (far ridge photo 1) came next and it was another fun ride through the trees on more mogul terrain. Then Resolution and Hornsilver from Pete's Express but nothing special here. I wanted to take Lover's Leap but the lift line was getting long so I headed back to the bowls. I took Ghengis Kahn and it was again a bit icy underneath but fun. I then cruised over to Gorky Park where there was absolutely nobody on the slope. I know they were all avoiding the ice, but it was cool to have the whole bowl to myself. The lines at the main lift were long here too, but the singles line was fast enough that I braved my way back to get in Lover's Leap (snow field photo 3). I did it and it was the awesome steeps I was looking for. It was getting on 2pm and I wanted to head back to the front side to finish out the day. 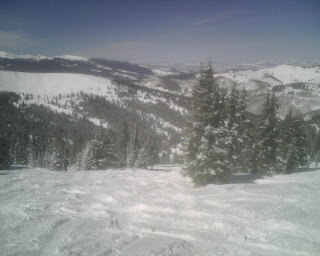 I meant to take Whiskey Jack to Sourdough but got distracted and went too far on the ridge so I cut through the trees. It was not much fun but was an adventure that reminded me of the days of going off trail at Powderhorn in my youth. I stopped for a beer at the Two Elks Lodge to rest my legs. The didn't have anything hoppy on tap, so I ordered a Shock Top and they hit me for $7.50. 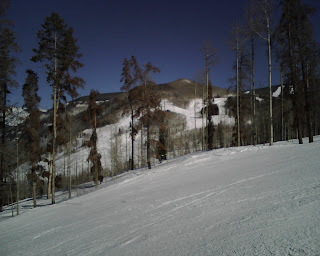 After the break I took the Northwoods lift, down Whistle Pig, and up the Wildwood lift into the Game Creek bowl. I had a focus on the Haro trail, but it was actually named Faro (photo 4). This little bowl is mostly blue and mostly forgettable. I took the Lost Boy trail on my way to the final goal: the Gondola. Lost Boy afforded great views and easy slopes. I made it to the Gondola just before 4pm for a beautiful fast ride up the mountain. I ended the day with a descent of Columbine (photo 4) and International. I've looked at this run for over a decade from highway I-70 and finally seen it from the other side. My cell phone caught a good pic so I included the third photo... my artistic contribution to this post. 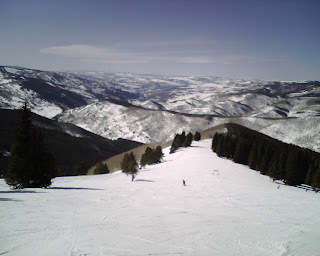 If and when I make it back to Vail I would like to explore the Sun Down Bowl next time. I would like to try Divide and Encore on the Skyline Express lift too. They both look to have some great black diamond runs. Otherwise I will leave this resort and the high ticket price to the tourists (last photo).